Forget fight songs. 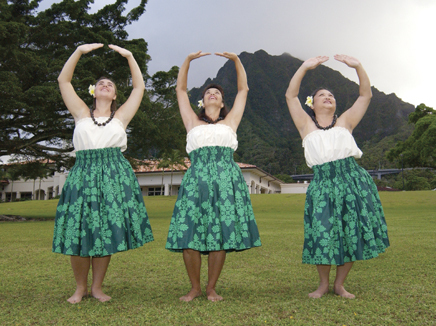 Windward Community College has it’s own hula, which speaks of a school for the multitudes, standing proudly against the Ko‘olau mountains and visited by gentle breezes and the kolea bird. Conceived and choreographed by Earl Pamai Tenn, kumu of the college’s halau, it was written by Hawaiian studies instructor Fred Kalani Meinecke and Emalia Keohokalole to the tune “Ha‘aheo Kaimanahila.” In his classes, Tenn emphasizes traditional values and the underlying meaning of Hawaiian songs. 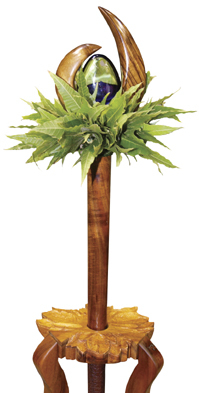 Three students in Maile Andrade’s Hawaiian art studio class spent two years creating a pair of ko‘o (staffs) to fill the role of maces in commencement at Manoa. The ko‘o complement each other in a manner common to Hawaiian and Pacific island tradition. One incorporates symbolism of the female, fire, empowerment and wisdom; the other, elements representing the male, water, knowledge and humility. Originating as medieval battlefield war clubs, maces are carried by university marshals to signify their institutions’ authority in academic ceremonies. Used for the first time at Manoa’s May 2003 commencement, the new ko‘o will be on display at Hawai‘i Hall between ceremonies. The John A. Burns School of Medicine has established a Department of Complementary and Alternative Medicine headed by nurse-researcher Rosanne Harrigan to look at healing Hawaiian style. Researchers are examining traditional ethnobotanicals of Polynesia (see list) as well as Asia to stop bleeding, relieve headaches and asthma, ease the pain of childbirth and treat diabetes and high blood pressure. The medical school also established the nation’s first academic department devoted to the healthcare needs of Native Hawaiians. Under the direction of physician Marjorie Mau, the new Department of Hawaiian Health will address both cultural factors and biological health risks affecting Native Hawaiians through research, education and healthcare practices that promote wellness. Administrative offices and research operations will be located at the new medical school facilities under construction in Kaka‘ako. The massive reduction of the Hawaiian population from pre-Western contact to the mid-1800s created a DNA bottleneck. Genetically, the Native Hawaiian population became much more homogenous than other population groups. A homogenous genome renders a group more susceptible to polygenetic disorders, such as hypertension, diabetes and renal disease. But it also reduces variables that complicate testing of experimental treatments for these disorders. Charles Boyd, of the Pacific Biomedical Research Center’s Hawaiian Genome Project, proposes licensing the Hawaiian genome as the intellectual property of the Hawaiian people. The advantages are twofold—encouraging clinical studies of treatments that could benefit Native Hawaiians and generating revenue for the Hawaiian community from royalties on successful drugs. It’s a potentially lucrative market—Roche pharmaceutical company paid $200 million outright for rights to the Icelandic genome, which underwent a similar bottleneck. Hawaiian culture infuses UH Hilo programs for visitors. English Language Travel Study helps college students from around the world improve their English skills while experiencing Hawaiian culture through field trips and introduction to Hawaiian history and crafts. Call 808 974-7664 or e-mail ccecs@uhh.hawaii.edu. In Hawaiian EDventure, visitors age 12–90 spend two weeks in hands-on activities related to Hawaiian culture and the natural environment of the Big Island. E-mail foxgolds@hawaii.edu. Hilo’s Ka Haka ‘Ula O Ke‘elikolani College of Hawaiian Language regularly hosts visitors who want to revitalize indigenous language in their home communities and countries. Hotel executives, tour guides and curious community members alike turn to Kapi‘olani CC for Interpret Hawai‘i, a series of courses developed to preserve and promote the historic and contemporary host culture and language of Hawai‘i. By exploring the artwork, music and dance of the islands, students learn to interpret Hawai‘i accurately to visitors. In addition, Kapi‘olani offers the only history and culture certification class in the state. This 24-hour introductory course, Hawai‘i no ka ‘oi, provides tour drivers, guides and interpreters with professional training in Hawai‘i’s unique culture, history, geology and language. Contact the College of Continuing Education and Training or call 808 734-9567. Students at UH Manoa’s School of Travel Industry Management learn to appreciate and apply Hawaiian cultural values in the management of their industry. They study Hawai‘i’s rich history as a host culture, as well as the social, political and environmental impacts of global tourism on the island state. The concept of ho‘okipa, a Hawaiian values-based hospitality system, is viewed as fundamental to visitor industry growth in the 21st century. Call 808 956-8946. Completed in 2002, the two-mile Waikiki Historic Trail wends past 23 historically or culturally significant sites, 19 of which are designated by bronze surfboard markers. Under a $3,000 grant from the Native Hawaiian Tourism and Hospitality Association, Kapi‘olani CC will help maintain the trail. The grant funds curriculum development, consultation and training of volunteer trail guides, who lead two free tours weekly. The Kalia tour covers the grounds at Fort DeRussy and the Hilton Hawaiian Village; the Queen’s tour extends from Kapi‘olani Park to the Moana Surfrider Hotel. For information, call 808 737-6442. As part of their graduate work in ethnomusicology at Manoa, U‘ilani Bobbitt, Tim Ho and Aaron Sala produced a concert with the Sheraton Moana Surfrider to honor the historic hotel and its importance to Hawaiian music. Funded by the Chie Yamada Endowment, the March 2003 event included 1960s footage from the Hawai’i Calls television program and brought veteran entertainers back to the Moana stage for a memorable community performance. Since offering its first hula class in 1969, Manoa’s ethnomusicology program has pioneered the academic study of music pluralism and supported the musics of Hawai‘i’s communities. In addition to hula and chant, Hawaiian chorus and ensemble and slack key guitar, the program offers ensembles devoted to the music of Asian and Pacific cultures. At Windward CC, the Hawai‘i Music Institute offers non-credit courses in the instruments and voice of Hawaiian music with instruction by the likes of Peter Moon, Byron Yasui and Melveen Leed. The institute also offers classes in composition and the business aspects of music. In Pat Gooch’s Hawaiiana for young children class at Honolulu CC, future preschool teachers examine their own list of values—such as aloha (compassion), malama (caring) and kokua (helpfulness)—and discuss ways to reflect these values in their daily relationships with family, co-workers and the environment. Gooch also runs workshops in preschools for parents and staff to explore their values and how these come into play in their interactions with others. As part of Windward CC’s Polynesian voyaging–ethnobotany class, students are carving a one-person fishing canoe from an 11-foot Norfolk pine log under the watchful eye of master canoe builder Bobby Puakea and former voyager Wayne Washburn. Students learn about Hawaiian culture, religion and ethnobotany as they experience the community effort that canoe building represented in ancient Hawai‘i. The canoe will be used by the college’s natural science department. At Honolulu CC, meanwhile, marine technology students apply modern fabrication techniques to ancient craft. In addition to designing a double-hull canoe for the Polynesian Voyaging Society, they created molds for a resin/fiberglass voyaging canoe for UH Hilo and 4-person surf canoes for any educational or non-profit group willing to supply materials and labor. They will also learn about voyaging as they work to restore the society’s veteran Hawai‘i Loa canoe. About 2,500 Manoa graduates have opted to receive diplomas printed in Hawaiian since the option became available in spring 1995. Alumni who graduated since then are still eligible for the Hawaiian language diploma—contact Admissions and Records at ar-info@hawaii.edu for information. Since its original publication by UH Press in 1957, the Hawaiian Dictionary by Mary Kawena Pukui and Samuel H. Elbert has sold more than half a million copies. Reprinted 13 times, it has expanded to nearly 30,000 entries. It has been translated into a Hawaiian-Japanese version and found its way into libraries and bookstores in Europe and across the U.S. mainland. And it paved the way for the publication of Hawaiian place name guides and language texts, histories and word puzzle books. Offered through the College of Continuing Education and Community Service, the courses use the same curricula as on-campus classes. Kalena Silva, director of Ka Haka ‘Ula O Ke‘elikolani College of Hawaiian Language replaces textbooks with vocabulary lists, explanatory text, exercises and quizzes on the Web. Plans call for adding 200-level language study and possibly culturally based courses, such as the Hawaiian ‘ohana and music classes. The release of Apple Computer’s new computer operating system last August was a breakthrough for Hawaiian language advocates. Macintosh OS 10.2, nicknamed “Jaguar,” includes a Hawaiian keyboard layout and improved fonts that display letters containing the diacritical marks used in the Hawaiian language. Programmers at Apple Computer collaborated with staff at the Hale Kuamo‘o Hawaiian Language Center and the Native Hawaiian Serving Institution, both part of UH Hilo, and ‘Aha Punana Leo immersion school. Sorry, Microsoft Word software doesn’t recognize the keyboard. Still, Hale Kuamo‘o Director Keiki Kawai‘ae‘a is encouraged that a major vendor is supporting a language outside of mainstream European and Asian tongues. The center offers tips and resources for Hawaiian language in Windows and on the Web. Hawai‘i authors are increasingly using Pidgin—the Hawaiian Creole language that evolved from the plantation blend of Hawaiian and immigrant tongues—to tell their stories. Kapi‘olani CC instructors Lee Tonouchi and Lisa Linn Kanae, both UH Manoa graduates, are among the writers and writing coaches using Pidgin to portray life in the islands. The self-described "Pidgin Guerilla," Tonouchi is the award-winning author of Da Word from Bamboo Ridge Press and co-editor of the Pidgin-centered literary magazine Hybolics. He is also editor of Bess Press’ coming Da Kine Dictionary. Kanae’s poetry, personal essays and creative non-fiction can be found in issues of Hybolics, Tinfish, ‘Oiwi: A Native Hawaiian Journal and Journal of Hawai‘i Literature and Arts. Want to know more about Pidgin? Manoa instructor Kent Sakoda and associate researcher Jeff Siegel include common Pidgin words and familiar literature in their book Pidgin Grammar: An Introduction to the Creole Language of Hawai‘i, due out in July. Pidgin Grammar is described as the first serious book about the language’s origins and grammar written for non-linguists.